The beauty of travel is spontaneity. I had bought a one-way ticket to Texas to meet my family for my brother's college graduation, a great moment of celebration. Knowing that my parents had planned to be in the United States for some days, I knew the possibility of traveling together existed. So we started looking for tickets 2 days before the California trip, and we found really cheap tickets. We have family friends that live in San Jose, and before we told them about the possibility of actually getting tickets to go, they were calling us back asking what time they needed to pick us up at the airport. No questions asked. At the sign of a phone call, they dropped all their plans so they could spend time with us. At the end of the day, they are family and not just friends. My parents and them have been friends for 40 years, which made this trip much more special. We grew up with their kids, and while it was our first time visiting with them, it felt like home. We also saw one of my cousins whom we don't see often, so the combination of exploring a new place with family made this one of my favorite trips. We spent a day in San Fransisco, most of our time in San Jose, a day in Monterey and a day in Santa Cruz. What inspired me the most on this trip was the color palate. The greens of the mountains, surrounded by vibrant blue tones. I would say that my second favorite thing, besides enjoying the ocean was seeing all the different ways of expression through street art. It is always fun to be in creative cities and this was no exception. I had always wanted to visit California, but truly had no concept for what I was about to encounter. It was quite a delightful trip. 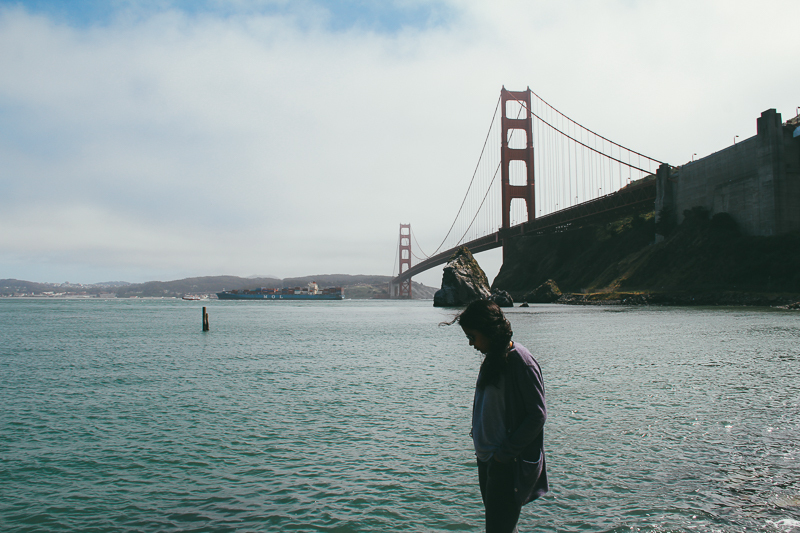 After visiting the infamous Golden Gate bridge and taking too many pictures we proceed to a day in the city. 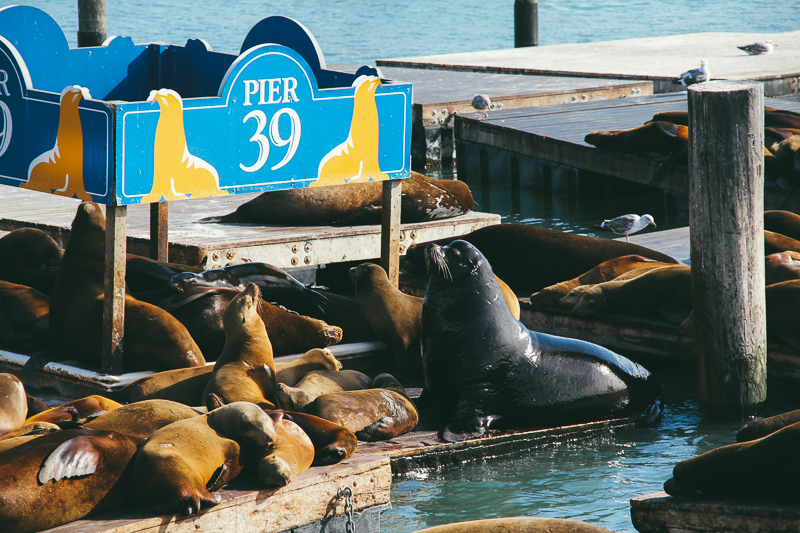 We chose to walk around the famous Pier 39 and see all the tourist attractions. We parked by the pier and walked over to visit all the chocolate stores until we arrived in front of the famous Alcatraz prison. Then they took us to see sea lions. Those animals are some of the largest I've seen. They smell terrible, but I loved that they were all soaking up the sun together. I had never seen them before, and I was in shock with the amount that we saw. As we kept going we walked into a "historic museum" (really it was an arcade), and my inner child could only remember a scene in the Princess Diaries where Mia and her grandma had a day in the city. Here my dad and brother proceeded to play a match of boxing as if it was the first time they played in their life. Such a creepy little arcade, but I think it embodied a lot of the past culture of the United States. We finished the night off with a clam chowder bread basket on the street, boy was that good. To top off the delicious clam chowder we walked towards the Ghiradelli factory. My mother is obsessed with chocolate so it was quite the visit for her. It was like a child's first time at Disney World, her levels of excitement were off the roof. As we walked towards the car we stopped by some art galleries and enjoyed the last couple of sites. There is so much to see in this city, I hope to go back one day. It was a cold day, colder than what I had packed for (I had packed clothes for Texas) but that didn't stop us from adventuring on. Our friend, Jairo, loves to fish and this is one of his favorite spots. We arrived at the dock and walked all the way to a lovely lighthouse. I was instantly inspired by the cement shapes that were used to make the path to the lighthouse. So I proceeded to ask my brother to be my model for the day. The contrast of the cement with grays and browns against the color of the ocean and overall gray colors of the moment created pictures with cool (as in the level of heat) tones. Something about metallic colors and browns always fascinates me. 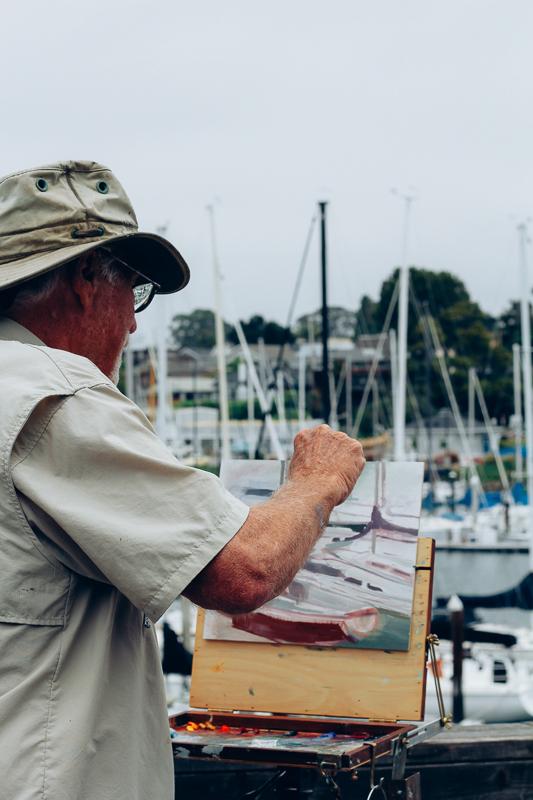 We saw a painter who was doing plein air painting, a fun showing of creativity and proceeded to drive along the coast. We ate lunch (picnic style) close to a small surf museum as we glanced at the community of surfers who jumped off of a nearby rock in search for the best waves. The thrill of the sport, the colors of the ocean, and purple flowers on the sides of the rocks made it a scene that I will never forget. As I wrote this post I quickly realized that I had too many pictures. So I'm posting again tomorrow (don't worry the post is already in queue) except this time all pictures have one thing in common: they are inspired by the color blue. I hope you come back.